Scary needles like this could soon be but a bad memory. Cutting-edge research done in laboratories behind closed doors can often seem a little esoteric - or, to put it another way, pointless - to most of us, but here's one breakthrough that we guarantee we can all appreciate. 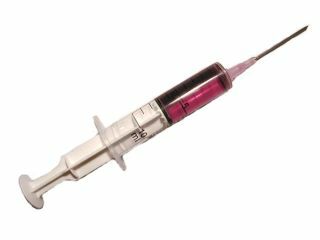 According to reports [Subscription link] from Japan, a research group at Tokai University has perfected a technique for creating hypodermic needles that are so small they cause no pain at all when used on sensitive human flesh. The key to creating the new needles - which, at 50 microns in external diameter and 25 microns on the inside, are as small as the proboscis of a mosquito - lies in coating a copper wire with titanium by the sputtering technique. Once the wire is completely covered in the biologically inert metal, it is then melted to leave behind a perfectly formed tiny tube that can be sharpened and jabbed painlessly into the nearest arm. Compared to the 200 microns of a standard hypo needle, it's pretty clear to see that the Tokai tubes have a bright future - if doctors are prepared to relinquish their pain-inflicting rights, that is.